At last, the factory tires wore out and I finally had a reason to get new tires for the CR-V. While excitement to spend hundreds of dollars on new tires isn't common, I was ready. I pondered Goodyear’s and Michelins and anything from TireRack.com with a good rating. It comes at no surprise to me that the factory installed Bridgestone Ecopia tires were not listed with a good rating. While I didn’t have much of an opinion about their noise level or dry handling, I cringed every time it snowed or roads became icy. The Bridgestone tires had an M+S rating (Mud and Snow) but even with a light dusting of snow, the CR-V’s traction control system and ABS was overwhelmed. Cornering, stopping, starting and anything in-between was a nail biting experience with only patchy spots of snow on the pavement, add in a freezing mist and you might as well just plan on walking, it would be safer. The Bridgestone tires were also nearly at the wear bars with 26,500 miles. 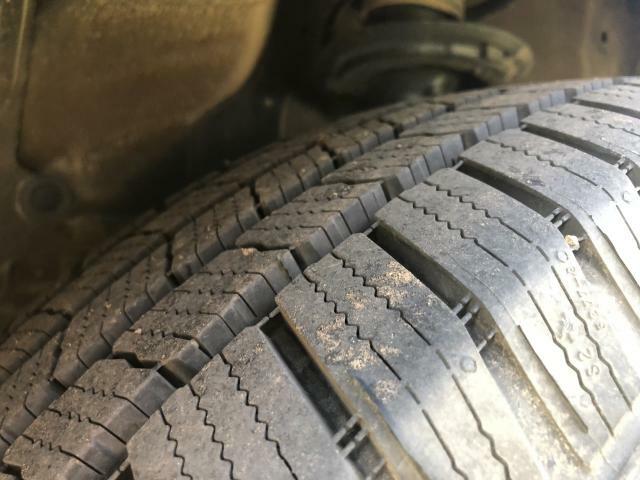 The dealer said they had about 4/32 or so of tread left when I brought the car in because it smelled of gas when idling after short drives and few other things. These tires had a warrantee of either 65,000 miles or 70,000 miles, but I didn't want a replacement Bridgestone because of my experience with them in the winter. The only aspects of these tires I really liked were their ability to go through mud when they were new (once they started to wear, traction became an issue) and the gas mileage the car achieved. I would routinely get 34 to 36 miles to the gallon at 60mph on the highway. That is between 1 and 3 mpg higher than EPA estimates if you trust the cars on-board mpg calculator. The main reason I bought the CR-V was the estimated gas mileage on an AWD vehicle, so when looking for new tires, I wanted to make sure I didn’t compromise that feature. I really liked the Goodyear Assurance WeatherReady tires, they had a good price and reviews, and were rated as an all-season tire that had a true snow tire performance marker, but this was also their downfall for me. Between concerns about decreased gas milage and excessive tire wear, something with the 3PMSF markers (true snow tire) became less desirable. I really wanted a tire brand I had on my previous SUV (newer gen Ford Explorer), the Michelin Defender LTS M/S; up until about three weeks ago, they were not available for the 18 inch rims on the CR-V online. I was able to drive my old SUV through anything and never worry about loosing traction, but I noticed my gas mileage on that vehicle decreased with these tires by about 1 mpg. I gave the Michelins a chance on my CR-V because I had such an overall good experience with them on a past vehicle and if I lost 1 mpg, so be it. I had a Michelin tire shop installed them at about $180 per tire and $30 for mounting and balancing. The rims on the CR-V look very delicate, but the tire shop did a good job and I don’t notice any marring from the de/mounting process. The tread on the Michelins are the first thing I noticed; they are a beefy looking tire. These tires really grab the road on turns, the noise doesn’t sound different from the Bridgestones and the ride seems to be slightly improved. Best of all, my gas mileage so far is largely unchanged with the Michelin tires (so far, the average is actually up .5 mpg but time will tell if this tendency holds up, I've put about 1,000 miles on them). I think there was a bit of a break-in period - a hundred miles or so – where the car rode stiff and handled a bit strange, but once that passed I couldn’t be happier. While I haven’t driven through snow yet, I did take the car down a muddy road just to see how well the tires bite when traction loss becomes an issue. I parked the car in the middle of a mud puddle, the tires sank about two or three inches into the saturated dirt, I gave the car some gas and it pulled itself out with no issue. While I didn’t put myself in a situation were I could easily get stuck, I could tell these tires were much better in the mud than the aged Bridgestone. Michelin really earned the 'M' from the M+S rating in my book. So far, my only complaint is these tires sometimes feel unsettled on city streets at lower speeds. If the road is uneven or distorted in some way, you can feel the tires grab at the road and pull the car left or right until the road evens back out. I don’t really mind this, but it is noticeable; I wonder if as these tires wear down a bit if this will be less of an issue. At highway speeds, I don't notice this. After my first experience in snow with the CR-V and it’s stock Bridgestones, I actually considered buying new tires on my new car (with less than 8,000 miles on the odometer), but quickly found I didn’t like the selection. What I found so disappointing was there were very few tires sold online that had a tread to handle mud and snow, still achieve good gas mileage and have a warrantee exceed 45,000 miles. The Michelins Defender LTS M/S are a bit more expensive than other tires, but their warrantee is rated to 70,000 miles. These Michelin Defender LTX M/S tires seem to fit all my needs. 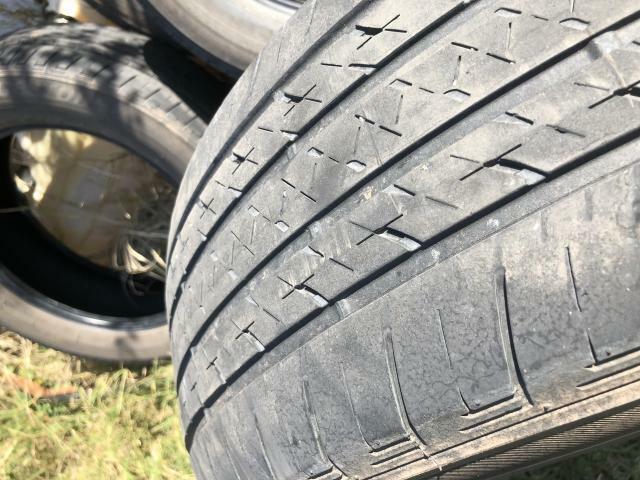 I only buy Michelins these days, and plan a new set soon on my newly acquired CR-V, which currently has Pirelli Scorpions on it, which I find loud and stiff but seem to be wearing well. As far as mileage warranty goes, I've noticed this year Michelin has lowered the numbers on most tires by a considerable amount. On my current set of Michelins - on my F250 4x4, they had a 90k warranty, but it looks like they will barely make 40 to 45k. I've always kinda thought they were a little overenthusiastic with that anyway. But they have been excellent tires, quiet, smooth, excellent traction in all conditions both on and off road. I can't really comment on mileage as that beast gets ten mpg, period. Which is why I am selling it, and why I got the CR-V. I would recommend getting your alignment checked. Or, making the mental allowance for the difference in geometry between the worn out tires and the new ones, which are larger in diameter and have no wear, uneven or not. You might find that the factory alignment is a little off anyway. I seriously doubt they run them onto an alignment machine off the production line, so, while it might meet a certain tolerance, that doesn't necessarily mean it is dead on. Could easily affect handling and wear. 2016 Pilot EX-L...changed to Michelin Defenders at 36K. Car drove better than when it was new. Just traded it in on a '18 CRV EX-L and the tires still looked brand new at 60K. I replaced factory Duelers with Michelins on my 2014 Tacoma...same experience. My Tundra now has Michelins and my son's 2014 Corolla just got Michelin Defenders last week. My 2013 Si has Michelin's. My wife's new '18 CR-V has 350 miles on it and I'm partly considering just putting Michelins on it right now. Why didnt you go for the Primacy MXV4s instead? The Defenders are more suited for heavier SUV and body on frame trucks. As to our super light tiny engined CR-Vs seems like the weight of the vehicle (roughly 3,300-3,500lbs) where the Defenders are rated at roughly 3,300lbs per tire. The Primacy are rated around 1,300-1,700lbs per tire. Which could help explain why your tire seems to grab uneven pavement since the weight of these CR-Vs cant keep the tires planted due to the light weight nature of our vehicles. I could suggest lowering your PSI by 1-3 but it could cause uneven wear but gain better traction. It could also throw up a incorrect PSI warning indicator on the dash. Then again if you're hauling heavy things in your CR-V (like bars of pure gold) I could see the benefits of the Defenders in the long run. Hope this helps & I too am a huge fan of Michelins! My other car has Pilot Sports AS/3 on them and they ride like they're on rails. Stock rating on my '07 is 102V. Last edited by kloker; 10-28-2018 at 10:48 AM. just FYI never judge a brand and its tires based on what comes on your vehicle new. They are NEVER the same as what you buy aftermarket. Michelin tires that have come on new vehicles have gotten the exact same response and complaints. The treadlife warranty doesnt exist because the tires dont last, traction goes to hell in the first 6 months because of the crappy hard rubber compound used for the tread. Also worth checking out and what I went with -- BFGoodrich Advantage T/A Sport LT -- a newer compound tire with 3P snowflake branding & 65,000 mile tread warranty. Not a true winter tire yet better than an all-season tire. Your load rating info is off. You may have been looking at the Defender LTX. The regular defender series is virtually the same load rating as the Primacy MXV4. 1874 max load vs 1929. Both passenger tires. If you get into the LT tires, the Defenders load ratings go way up. Both the Primacy and (passenger) Defenders are recommended for family sedan, crossover and minivans. When these Hankooks give me an excuse Michelin Premiers or other Michelin will go on. Premiers have given us great service. Just switched from Hancocks on 17 CRV Touring awd with 19,000 miles tp Michelin Premiers A/S. Hancocks had thread left but way to noisey and distracted from a great vehicle. Ride and handling is better and road noise is gone. I'm glad I did not wait any longer to swap them out. Bye, Bye BMW, Hello CR-V!